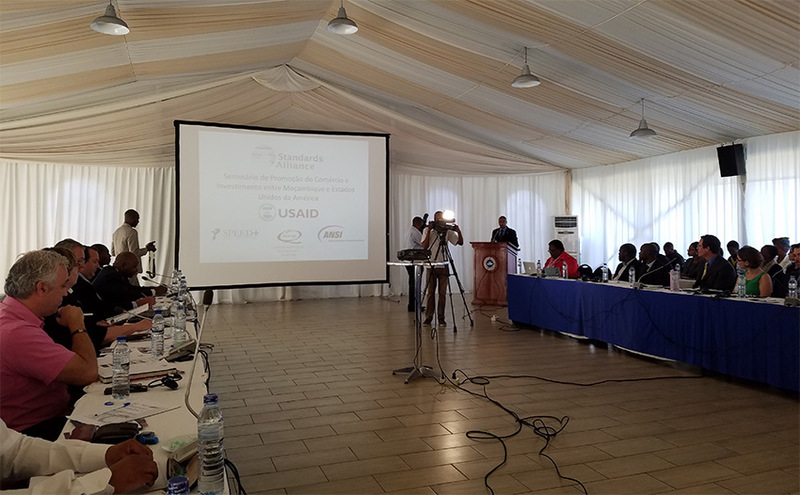 The American National Standards Institute (ANSI), through its public-private partnership with the U.S. Agency for International Development (USAID) called the Standards Alliance, organized a one-day workshop in Maputo, Mozambique, on August 10. The event, titled “Using the National Quality Policy to Promote U.S. – Mozambique Trade and Investment,” was co-hosted by the Instituto Nacional de Normalizacao e Qualidade (INNOQ). The workshop included 72 participants from the public and private sector and featured presentations by U.S. and Mozambican participants, including representatives from Bureau Veritas, Bristol-Myers Squibb (BMS), Underwriters Laboratories (UL), Regulatory Strategies and Solutions Group (RSS Group), INNOQ, and the Mozambican Ministry of Industry and Commerce (MIC). Workshop presentations supported the Mozambican government’s ongoing development of a national quality policy and provided an opportunity for Mozambican participants to become consider ways to use their draft national quality policy to enhance bilateral trading relationship between the U.S. and Mozambique.